Think Your Medical Data is Secure? When it comes to protecting medical practices from security incidents and data breaches, there are a lot of myths and misconceptions floating around. Because the world of medical safety compliance is so vast, we wanted to help clear the air of any confusion. Don’t wait until it’s too late; your data and business deserve a proactive approach. 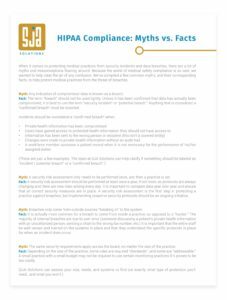 Grab your copy of our 8 Myths vs. Facts of Protecting Medical Data Security Guide below. We practice what we preach. Your data is secure, and we won’t use it for anything else without your consent. We’d love to hear from you. Fill out the form or call us at (616) 451-2045.